for the prevention and treatment of many serious diseases. The ability to squat is a precious gift from Mother Nature. Two-thirds of humanity use this posture every day for resting, working and performing bodily functions. We in the West abandoned squatting less than 200 years ago, when we adopted sitting toilets. Straying from nature always has its consequences. The habitual use of sitting toilets causes subtle but relentless damage to the colon and pelvis. This book presents compelling evidence that the “porcelain throne” is the unknown cause of many diseases - including appendicitis, colon cancer, colitis, diverticulosis, hemorrhoids, prostate disorders, and pelvic organ prolapse. Computer scientist and inventor Jonathan Isbit spent eight years researching this book, in conjunction with colleagues from around the world. 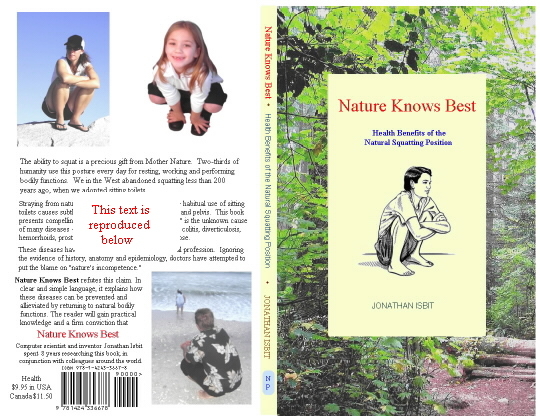 For a glimpse of the book's contents, see the Health Benefits page of this website.